Although surrounded by countries where glamorous cities are getting bigger, better and taller, Oman has managed to retain an authentic flavor of the Arab world the way it must have been years ago. There are so many reasons why Oman should be on top of your travel bucket list, but here are ten of the best reasons Oman is worth a visit. The Sultan Qaboos Mosque is a fantastic example of the rich Islamic architecture in Oman. It was a gift to the nation from Sultan Qaboos on the 30th anniversary of his reign. With its ornate patterns and awe-inspiring chandelier, the prayer hall is a fascinating site for worshippers. The Persian carpet alone measures 70m by 60m wide, making it the second-largest hand-loomed Iranian carpet in the world, it took 600 women four years to weave. The mosque can accommodate 20,000 worshippers, including 750 women in a private musalla. The ruler of Oman, Sultan Qaboos bin Said, opened the Royal Opera House Muscat in 2011. The mesmerising architecture and picturesque grounds justify a visit even if you are not into the Arts. The Opera house incorporates traditional Omani aesthetic with modern acoustic technology, making it a unique sight in Muscat City. Your visit to Oman must include a visit to Jabal Al Akhdar or 'Green Mountain' which is around 3000 meters above sea level. The mountain is a part of the Hajar Mountain range and is just a two hour drive from the capital city, Muscat. Jabal Al Akhdar is unique in that it is covered in trees and shrubs, a green oasis in an otherwise mostly desert landscape. The temperatures are mild year round making it a great location for tourists. Musandam is one of the most unique areas in the Gulf region. For many years, only boats could access the traditional Omani fishing villages that were located along the coastline. The creation of a new road now allows access to Zighy bay, a quiet and secluded cove which also has a stunning white sand beach. There is also plentiful accommodation in Zighy Bay thanks to the Six Senses resort. Camp under the stars at Wahiba sands which is located a considerable distance from the capital city. Take a break from the city to experience Bedouin life through Desert safaris and Camping treks. The Al Hajar Mountain range is a fantastic location for trekking enthusiasts. It's also a picturesque location guaranteed to take your breath away. The drive to Wadi Ghul also adds to the experience, during your travel you'll be sure to encounter 500-year-old stone villages and experience traditional Omani culture. A short distance from the Wahiba Sands lies the port town of Sur. Sur is particularly known for its annual turtle migration. Thousands of sea turtles migrate across the Arabian gulf to lay their eggs on Omani shores. It's a phenomenon that has attracted tourists from across the world. Sur is also home to a number of historical castles and beautiful beaches. This whole area of Oman including the Masirah islands (accessible by plane or ferry) is used by the Sea turtles for the annual migration making it easily accessible for viewing. Salalah city will definitely change your perception of what a typical middle eastern city looks like. Thanks to an annual monsoon the city's mountains are transformed into lush green ranges a juxtaposition in a normally arid and sandy landscape. 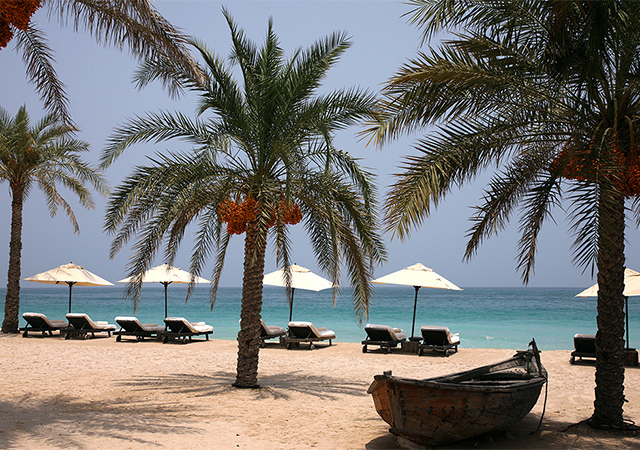 With temperatures hitting almost 40 degrees in other parts of the country, Salalah is a welcome retreat for citizens wanting to escape the harsh Muscat sun. This area of Oman also has historical and religious significance with the tomb of Ayoub AS within the city. When you think of Oman you might not automatically think of food. But Omani culture has a rich culinary tradition. One of the most popular dishes in Oman is called shuwa, which is a lamb dish served with spice-infused rice. The preparation is usually quite lengthy and also requires an underground sand oven. The end result is a beautifully spiced meat dish that will knock your socks off. Shuwa is normally served on special occasions such as Eid. For those with a sweet tooth, there's the option of trying Omani halwa. Created with a variety of fantastically calorific ingredients it will be sure to satisfy your craving. There are many varieties of Omani halwa which have base ingredients like olive oil, date, and milk. Like many cultures, sweets are a sign of great hospitality and are often found at gatherings and special occasions.